(c) Digital art by Eria Sane Nsubuga, 2011. Ugandan artists must be passionate students of Ugandan tribal cultural norms and values, artifacts, material culture, and oral history if they are to win back their much needed relevance. Artists should go ‘native’, and perhaps it would be more interesting for the local language newspapers to write about visual arts. Written by Eria ‘Sane’ Nsubuga, visual artist. 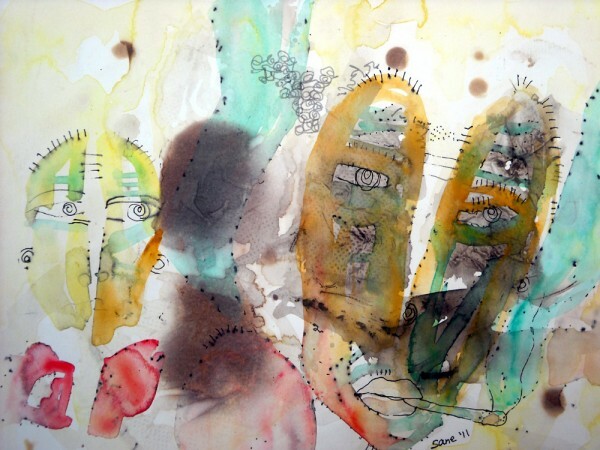 This is article was written as a response to the discussion between artists and journalists on ‘Visual Art and the media’ at the Goethe Zentrum/Uganda German Cultural Society in Kampala in April 2011. Other main contributors to the discussion were Ronex Ahimbisibwe, an artist based in Kampala, and Moses Serugo, a journalist based in Kampala. 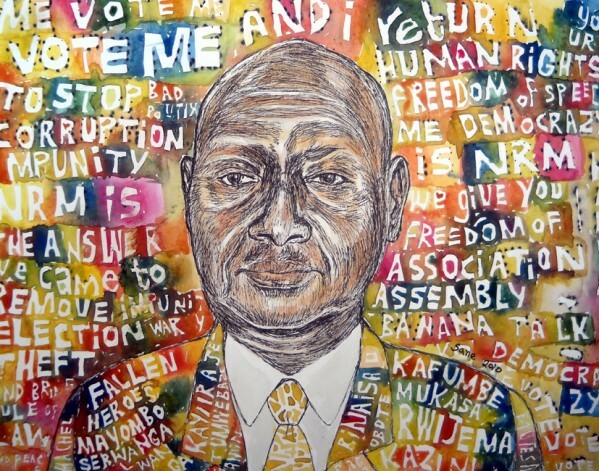 Ugandan art – where to go? What is the artistic ‘Ivory tower’? 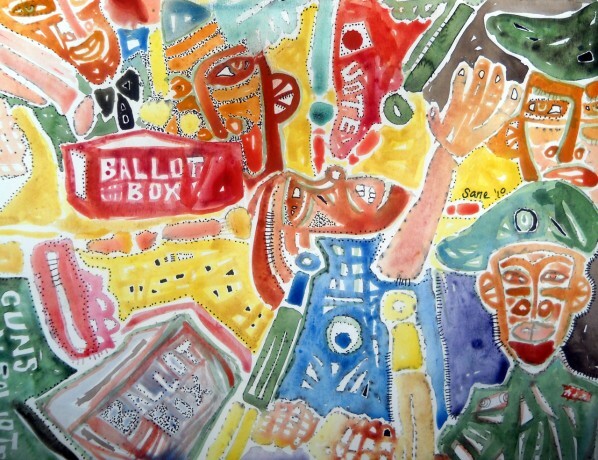 Are Ugandan artists overlooking their own electorate? And is Ugandan Art geared towards a foreign market or Uganda’s own population? 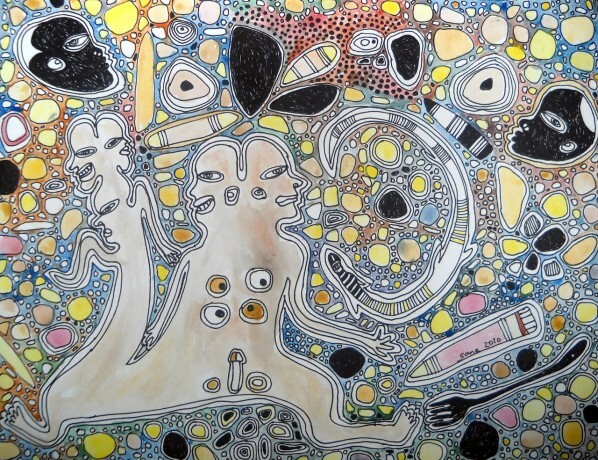 The art is looking for buyers with money, so the artists tend to focus on impressing mainly Caucasian buyers. As a result of this; society does not know or understand the type of art being produced … or is it really so? Should the artists then focus more on realist subjects (i.e. realistically perceived objects moving in localized space) that are talking directly about their own culture, and life, rather than on romantic ‘colloquial’ subjects aimed at enthusing relatively obscure European and American patrons? After all Uganda is a little country in the heart of a relatively unknown continent in a relatively ‘undeveloped’ region artistically in terms of supporting and enabling infrastructure. Uganda, as a country of 30 million plus people, has only ONE major museum to speak of in the whole country, and even this little museum is under stocked and in danger of total collapse/take over by certain well off and opportunistic property developers. We seem to be confused about the styles and techniques; referring to technique as the message other than the actual visual depiction or representation this arrangement of paints on cloth or panel depicts. We tend to value and worship what is white and foreign rather than ‘black’ indigenous? Statement: “Artists are arrogant, self absorbed and unapproachable”. True or false? Are they not supposed to be; after all, they are different and some may even call them special. Statement: “Artists are idealists, idle dreamers, lost touch with reality”. That may be. But “dreamers” and “seekers” of creativity and novelty are supposed to be exactly that. And maybe more. For this I cannot fault them. Statement: “Ugandan artists mimic foreign techniques and materials”. Very true. Artists here should be encouraged to improvise more. Look more at available material culture, the paints in nature and other man-made ‘found’ pieces and parts. How practical is it? This involves rejection of all Western materials, including paints like acrylics and oils, principles and elements like perspective and shape. We would then have to find viable alternatives in a frantic search for a new artistic paradigm. That is obviously easier said than done. However, all art about any society must be a reflection of the study or understanding of that society. 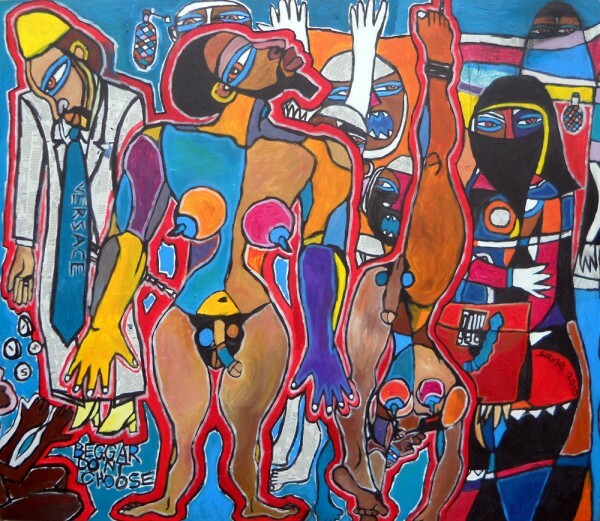 Is Ugandan art too pricey? Too cheap? African art, and in particular Ugandan art has got to be one of the most undervalued and exploited art forms under the sun. For me, as a surviving Ugandan indigene and artist, to price an original 20-by-20cm-painting of my work at $150 is both fair and unfair at the same time. On one hand because very few Ugandans are financially able or prepared to buy a decorative picture for the wall for any price above Ush 50,000, no matter how large or expensively assembled it may be. On the other hand, $150 is mere pocket money for many in the developed world. So the rich and wealthy are acquiring our art for a pittance in their perspective. And if the work is acquired for a low cost value, how then can the work be valued as a piece of Uganda’s intellect or culture? After all we live in a world that values money and its collateral above all else. How much energy, skill and research is put into developing motifs and ideas for our art here? I don’t know. My feeling is that we put enough time into paintings that are conventional and do not look to put across serious questions of society. After all we want the artwork sold, don’t we? And no one wants to be the one asking society to look into itself. Nobody wants their habits, personality or lifestyle questioned? Putting more time into planning an angle for communicative effect is now a preserve of a few artists whose work may then become difficult to sell to conventional buyers. So much of our art looks like decorative family house art, more than anything else. Artists prefer the decorative effect at the expense of communicative effect! A picture on the wall at such a “high price”??!! 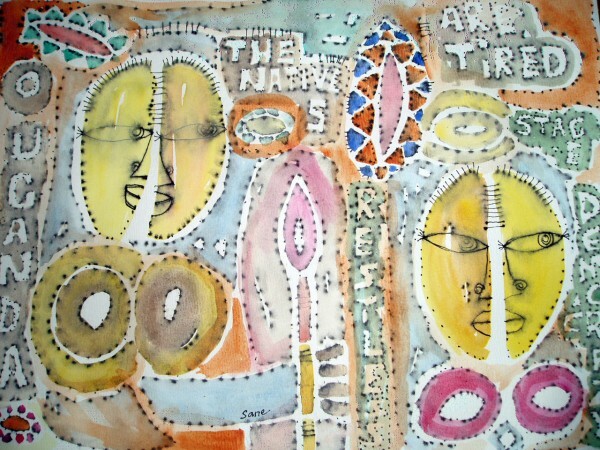 The Europeans, Japanese and Americans look at 150 dollars as a small price to pay for a little known African art piece. Little known being the catch word here. A man I highly respect, Joe Pollitt, and who has vast knowledge on African art, recently found out through Facebook, castigated me bitterly for putting my artwork up for sale on an online art sales point, and said I had become a “sell out” and had betrayed my artistic heritage. He even said that no European gallery will take my work now that I have become a “cheap” artist who puts my art up for mere “pocket money”. Facebook, Saatchi online gallery, Twitter, and others are making our art more visible in the virtual world, while at the same time improving our prospects of a level playing field in a vast ocean of internet activity. Online art is becoming commonplace, because I am able to show my work to an audience I may not ever come across. More people see and read our comments on Facebook and other social networks than those who actually respond in real life. Our art is now being discussed and we can get a straight reaction from viewers. Feedback for any art is very, very important. 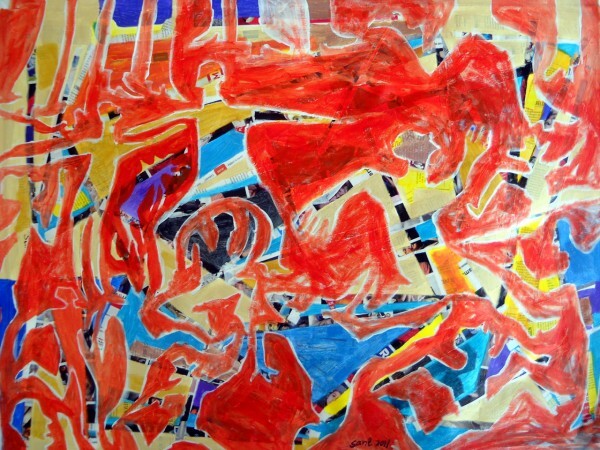 The artist would love to know what happened to his/her work after two years, even 10 or 20 years after the purchase. Most of us can only speculate whether the picture is hidden in a cellar, or was donated to a hospital, an art school, or thrown out with the rubbish. I have made a lot of work; these are children, children of my mind, and how I wish I could know where all my children are, or how they are. Anyway, back to online art; people get an opportunity to form opinions about my art, and decide whether they like me or not as an artist. That is their prerogative and right. The excuse that Ugandan art is unknown to the world is fast becoming worn out and irrelevant. Exposure is a hundred times more important than a sold painting. I would rather have all my work unsold and yet still visible to the world, than sell all my art and it all ends up in a cellar floor somewhere or on a bedroom wall. My art is meant to be seen everywhere, and while we are still unable to get the local print media houses to print posters, calendars, T shirts, billboards, cards, et cetera of our art, at least we have the platform to be loved, ignored, or hated online. After all, like somebody said: “There is no such thing as bad publicity”. The online versions of these newspapers, however, may be telling us an entirely different story. I have not checked yet, though. Statement: “Art should be written about”. That may be true, but if I become a writer on my own art, then my views are partial to me and not objective. Okay, so I will write about my own art, blow my own trumpet so to speak. Then, what is the use of the journalist? Is the journalist to be phased out as irrelevant? Art writers are few and far between, because the media houses are few, and their marketing policies do not include visual art half as much as promoting the already popular musical artists. They give to those who already have, hence the “celebrity virus”. Statement: “‘Popular people’ and ‘events’ sell papers, not just an action”. The belief that journalists are more interested in events than a discourse about the messsage of paintings, prints, sculptures and the like is understandable, considering that the viewers are seemingly fickle and get bored easily. Also, the notion that the newspaper is not an intellectual document is painfully becoming clearer. 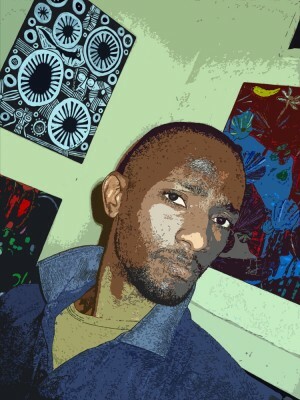 Learning from the media artist Peter Tukei: The artist is a successful, self-made individual who may or may not need the newspaper article to boost his/her image and sales. It would be nice if the journalists stopped being ‘haters’ and became active participants in the Ugandan art scene. What about the issue of language? Well, the journalists are advising us to learn from the musical artists who struggled for years until they became accepted by the local masses. Two variables here: One is the local languages (Luganda and others), and the other is the set up of the local FM radio stations in the early 1990s. Unlike music, visual art is just that: Visual. One must see it to perceive it as an existing entity, while music is not visible, but one perceives it through the sense of hearing. Language goes further than these. Language is being communicated through speech, i.e. sound, but also through sight (reading /writing) as well as touch (Braille). Right now, visual art – with the exception of some new forms of expressions like for instance media art and video art – is visually perceived, and as such still is relatively limited. Colour can not be felt or smelt. It must be seen. Texture may be felt, but not to explain any colour’s identity. Suffice it to say that print media journalism has played only a small part in promoting the arts as a whole, whereas FM radio has made music available to the masses virtually everywhere in the country. Whatever is said or sang on FM radio has an excellent reach here. Need I say that reaching these radio waves is free of charge. All that one needs is a receiver and cell batteries or other electrical source. The rise of local pop music is directly linked to the rise of FM radio stations. So, what about print media? According to Robert Kabushenga (Vision Media Group), in a joint interview with Dr. Githingi Gitahi (Nation Media Group) on the World Press Day May 3rd on KFM radio, the New Vision and The Monitor newspapers have only a combined readership of 5,250,000 people per day, with a paltry actual ‘buyership’ of 150,000 newspapers every day. However, each of these papers bought does get read by 35 people according to Kabushenga. That only a small fraction of the population is reached every day and week by a newspaper of some sort, tells about the relatively limited reach print media may possess. One might even suppose that a billboard by the side of some tarmac road upcountry may have better reach. This status quo may suggest a poor reading culture, but also of printed information being for the ‘privileged’. Few people here can afford to buy a newspaper everyday, let alone every week. Moreover, as far as visual art is concerned, the language of transmission of artistic expression and message is exclusively English, which is understood widely but which also is not understood by the big ‘illiterate’ population in Uganda. Also, I have the feeling that the point that English primarily is an academic and superficial form of expression for indigenous peoples is undoing the artists, because whatever they seem to be saying, it is not being received. Should the artists then go ‘native’? I should think so. Perhaps it would be more interesting for the local language newspapers to write about visual arts. I have heard of a plan by Henry Mzili Mujunga to coin a vocabulary for visual art in luganda. It is definitely a wonderful and fresh challenge. And like I asked him; how to translate ‘cobalt blue’, ‘vermillion’, ‘lemon green’, ‘chiaroscuro’ or even ‘silhouette’ into a local African language? This absence of scientific expression in local language is adversely affecting every sphere of not only Ugandan life, but also most of Africa. This is simply because so much valuable meanings, contexts, and pieces of information literally become lost in translation. An African thinks and acts like the genetic African he/she is. To try to make one speak a genetically different code of language, and therefore attempt to make one think and act in a different way, simply confuses the African mindset. Anyway, back to the debate at hand. Moreover, our education system is such that a methodology and terminology of art is virtually inexistent in the languages of Uganda (Luganda, Lusoga, Acholi, Ateso, Lugbara, Runyakitara, Langi, Japadhola and so on). If that mode of expression is left up to the artists to create by themselves, it is going to be an uphill task. However, if the education system encourages teaching of Arts and Sciences in local languages, then language may play in the favour of visual art. As it is, there is zero presence of art on radio, particularly FM stations. How about TV? Art is spoken about only in English. Artists and TV people alike would be hard pressed to explain the philosophy, methodology and terminology of any art on TV, especially if it is coherent explanation in details. There is still only a little visibility of visual artists on television. Few TV journalists understand the purpose and messages in visual art and other creative forms of expression. So the discussions on art subjects or objects is rather superficial. Moreover, TV still has a limited reach of the population; only about 500,000 households have television sets. With an average of eight people per house, one can assume that 4,000,000 people may access the information on TV. Nevertheless, local TV remains the single most important form of media that visual artists should continuously and unswervingly court. With television going digital, opportunities for a wider reach across borders also continue to grow. The artists should target a daily presence on various TV stations to explain themselves and their art. In light of this, every Ugandan artist have – as a matter of necessity and as a matter of fact, become students of the culture of their society. Ugandan artists must be passionate students of Ugandan tribal cultural norms, values, artifacts, material culture, and oral history if they are to win back their much needed relevance. As to whether the print media houses will help us in these areas are mostly up to them, but the work quite frankly must be ours; the creative minds. True reflection from the heart and with practical suggestions for going forward! Resonates with some of the critical analysis of the Arts & Culture Conference article in this edition of Start Journal. this article is amust read to all artists, keep it on big giant!